I first encountered Stevie DuPree & The Delta Flyers a couple of years ago on their 2010 release, Sixteen Bars. Their southern-fried brand of blues combines influences from Mississippi, Louisiana, and Texas. Their follow-up, Dr. DuPree’s Love Shop (Soulbilly Music Group) verifies that front man Stevie DuPree continues to be a versatile and charismatic singer, easily handling soul, R&B, blues, rock, and even country. The Flyers include guitarist Travis Stephenson, bassist Quentin “Q” Calva, and drummer Steve Bundrick. Some familiar faces join the Flyers for this release….Tenor sax/harmonica ace Mark “Kaz” Kazanoff contributes both musically and as producer, along with Nick Connolly (keyboards), the Texas Horns, and vocalists Alice Stewart and Lisa Tingle (who share co-lead vocals on the funky title track). Derek O’Brien adds slide guitar to the blues rocker, “Broke Up,” that opens the disc, and the inimitable Marcia Ball adds some New Orleans spice on keyboards to “First Dance.” “St. Paul’s Bottoms” is a gritty countrified blues with Kazanoff’s harmonica and Stephenson’s guitar providing fireworks. 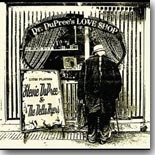 Dr. DuPree’s Love Shop will indeed be a hard act to follow. It shows The Delta Flyers to be in fine form, with their irresistible mix of southern soul and blues.